Having developed more dramatic and personal projects prior, UK born (but of Hong Kong decent) Chee Keong-Cheung instead tapped into the necessary idea of thinking of cinema as a business. 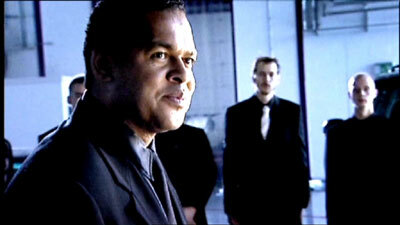 His directorial debut, the UK set tournament movie Underground was therefore born. 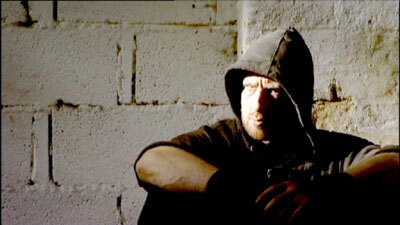 Also in the back of his mind (and co-producer Mark Strange's certainly) the need of showcasing the available martial arts talent currently working within the volatile martial arts action movie scene in the UK, Mark Strange star in what beforehand is quite the exciting notion of bringing back the tournament movie. Some things are simply not in or available this far into the new millennium. One is the way to clench the thirst of action junkies that often and wrongly wants the 80s hard hitting Hong Kong cinema back TODAY. The excitement surrounding Underground is unusual too and if there's a small thing us reviewers can do, it is to support heartfelt, dedicated work from a collaborative team wanting to showcase their very best. Which is why it's such a pleasure watching the lean, mean hard hitting machine Underground is. You've got your plot on the FRONT cover of the dvd basically ("Twelve fighters. One Tournament. A £500.000 title. There can be only one winner") and it's a sign of Chee Keong-Cheung's intent with the film. It almost seems that he's intentionally spread his director's statement in various quotes throughout as you get dialogue such as "Let's not waste any time", "Maximum entertainment" and those modest but oh so difficult goals you've sometimes got to clinch ARE... and then some. Underground is suitably aimed for a specific audience and perhaps provides its greatest challenge by treating its subject and subjects quite seriously. The whole structure of the tournament takes place within an internet streamed reality TV show and behind the scenes a group out of the wealth have put forth money that then leads to them subsequently choosing two of them to support. Thankfully the obvious comment about how TV has increased the ante, that mindless violence for maximum entertainment is the way is kept rather subdued and director Chee continues practicing the mantra of not wasting time. We're therefore ultra-quickly thrown into the frey of things and another challenge Chee manages to overcome is maintaining momentum after his opening credits which seems to be putting all efforts on the line in order to sell the film. Well done then, it did get sold but Chee has several more minutes of sweat, blood and grit to offer up thirsty viewers and buyers. Basically putting us in the middle of the ongoing TV production, the mix between a grainy look and video works reasonably well and isn't a stylistic excursion border lining on the forced either. Perhaps dictated by the low budget, it's refreshing also that each fight takes place in a standing, commonplace arena which really isn't much of an arena. Sometimes connecting to the fighters such as The Priest as his scrap IS set in a church but mostly just making sure to provide gritty backdrops, as soon as Mark Strange as The Homeless engages in the first fight, Underground reveals something very interesting. One, Dave Forman's arranged fight choreography comes with a clarity but also little fluid style as very few of the fighters are martial artists in the movie. Therefore the first punch knocks us over as the movie emphasizes brawls, bare knuckles and the bloody consequences of it all in some instances. It's a fitting choice that continues to ring true even when Liang Yang as The Foreigner brings his fine martial arts to the table. Not thoroughly engaging throughout all battles as Chee Keong-Cheung's similar narrative structure to each one gets a little tiresome (basically continually echoing how the fight starts and finishes within the TV production), he has the knack for mixing it up with dramatic character arcs and even somewhat successfully too. Going amusingly generic on us as you can tell from the character descriptions substituting names, Chee's key is to not linger on his drama. Therefore the personal motivations of the characters, often concerning family, has a true poignancy within the genre piece Underground is. He even wisely reduces dialogue of his fighters to a minimum as one would assume these aren't actors per say but with it enters a pretty decent exercise in subtlety. It's serviceable at best, which is a high grade actually and these dramatic intentions only fail to resonate within Liang Yang's quickly developed relationship with a girl he meets during a night out. Wisely, the majority of the arcs have to do with established past natures. That's why the aforementioned Liang Yang sub-plot isn't as effective. Even going to the lengths of speaking of a humanity awakening/humanity refusing to vanquish under the circumstances, the expected clash between fighting brothers remains a strong inclusion as well because again, Chee turns his head away before the film enters a pretentious arena it doesn't belong to. Underground genuinely surprises and despite director Chee Keong-Cheung having stated that cinema is about business and artistry (not a bad realization I should add), there is something unexpectedly artistic that is allowed to walk alongside the often brutal tournament piece this is. Making sure the beats and drama only take up a logical amount of time, this is perhaps the finest decision of the film. I.e. to get it out of the gate, into the frey and out. We don't mind that we wince, cheer AND care along the way. Audio: English Dolby Digital 2.0. *Behind The Scenes (8 minutes, 13 seconds) - Not much in way of substance here in a piece that's mostly dominated by cast interviews and brief behind the scenes footage. *Anatomy Of A Fight Scene (3 minutes, 8 seconds) - Showing footage from the rehearsal and final filmed version of the fight between Mark Strange's The Homeless and Leon Sua's The Triad, the latter half of the program is more useful as they play these separate pieces side by side. Joey Ansah - The Model (11 minutes, 41 seconds), Mark Strange - The Homeless (4 minutes, 25 seconds), Zara Phythian - The Teacher (2 minutes, 14 seconds), Nathan Lewis - The Ex-Convict (2 minutes, 45 seconds), Beau Fowler - The Delinquent (5 minutes, 23 seconds) Leon Sua - The Triad (5 minutes, 23 seconds) and Chris Smith - The Soldier (2 minutes, 17 seconds). *Deleted Scenes (10 minutes, 30 seconds) - 12 pieces, including 3 unseen fights, are mostly small snippets (some character-based) that were surely cut to keep things snappy (in particular the sloooooow scene of all the fighters arriving at the gym proves this). The additional fight action only adds up to about 2 minutes and is hard to engage in as it has no post-production foley work added. *Trailers & TV Spots - Features the theatrical trailer, Cannes Promo, Japanese Trailer (re-titled to Twelve in that territory) and 5 TV spots. *Photo Gallery (12 images which are very tedious to navigate through), Production Notes (a quick overview of the production in text) and the trailer for Bodyguard A New Beginning (found in the main menu). *Cast Biographies is split up into separate sections for "The Fighters" and "The Entrepreneurs". This means we get short bios on cast members Mark Strange, Nathan Lewis, Joey Ansah, Leon Sua, Glenn Salvage, Beau Fowler, Shane Steyn, Liang Yang, Zara Phythian, William Mickleburgh, Scott Houston, Chris Smith, Fidel Nanton, Danny John-Jules, Sophie Linfield, Gordon Alexander, Gary Webster, Leonard Fenton and Dave Wong. *Crew Biographies has short bios on the following (huge) number of people: Chee Keong-Cheung (writer/director/producer), Mark Strange (producer), Oliver Morran (writer/producer), Jim Howell (executive producer), Simon Barnes (executive producer), Chris Atkins (executive producer), Mike Leeder (executive producer), Andy Torkington (co-producer), Mark Towns (film editor), Simon Dennis (director of photography), Jake Corbett (director of photography), Dave Forman (fight arranger), Matt Routledge (additional fight arranger), Jenny Cochrane (sfx & make-up designer), Stuart Hancock (music) and Vince Watts (sound editor/designer). *Pain & Glory - Section with promotional material for the following releases: The Best Of Pain & Glory (7 minutes, 15 seconds) and Mark Strange: The Road To Pain & Glory (5 minutes, 30 seconds). Former features a full fight from the collection and the latter is a preview of the documentary Mark is the focus of.